Our city stands to gain a brighter future once the Port Lands is flood protected. In the event of a major flood, the measures put in place through this project will help prevent loss of life, and damages to businesses and homes. A healthier, more natural mouth for the Don River will revive the Don’s legacy as a hub for recreational activity. It will join Tommy Thompson Park as one of the best natural greenspaces in the city to explore, creating new opportunities to fish, hike and boat. An estimated 18,000 – 25,000 people will live in the Port Lands once it’s fully developed. The project will also create jobs for an estimated 25,000-30,000 people living in Toronto. Another 50,000 people will work in the planned East Harbour development north of the Port Lands—an area that is also at risk of flooding. Overall, the project will contribute $4 billion to the Canadian economy. Protecting the environment is also at the heart of this project. 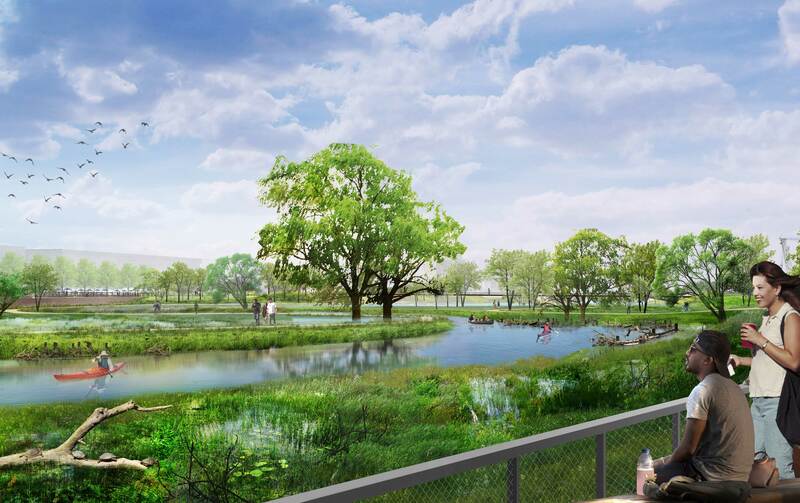 We are replacing industrial land in the Port Lands with 32.7 hectares of naturalized area—that’s 5.4 hectares of terrestrial habitat, 13 hectares of wetland habitat, and 14.3 hectares of permanent aquatic habitat. Our work will strengthen biodiversity, help clean our waters and better connect us to the waterfront. The new river valley will create Villiers Island—Canada’s first climate positive community. This means it is designed to eliminate the greenhouse gas (GHG) emissions it creates to below zero in an economically viable way. Climate positive developments accomplish this goal by reducing their own emissions and offsetting the emissions in neighbouring communities. Villiers Island will showcase innovative products, policies, solutions and processes in economic sectors such as clean technology, design, sustainable construction and energy systems. An artist’s rendering of the future park on the north side of the new river valley.